A new deck can really add value and a great look to your home. When researching decks, there are some options out there such as a low maintenance decking or wood decking. Low maintenance decking can also be known as composite decking, is a deck made from a wood-plastic material. 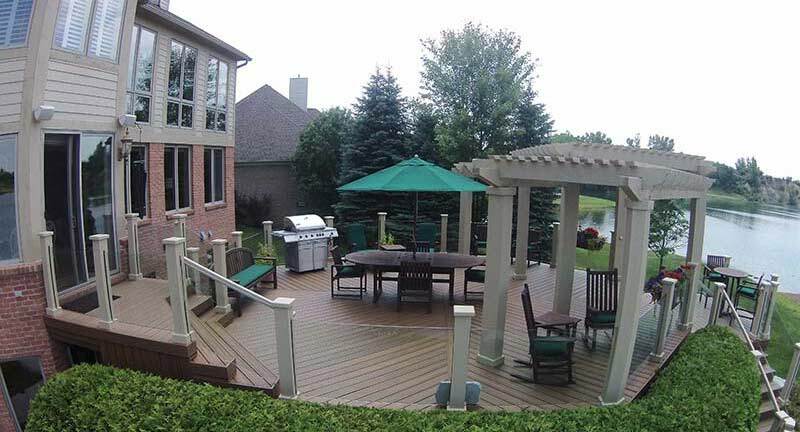 While a wood deck is always a great choice as well, composite decks require way less maintenance. Wood decking will require cleaning, sanding, staining and possibly replacing wood. Where a low maintenance composite deck would not require that type of maintenance. A wood deck could be worn away or even get insects to tear it apart. Splinters and worn out wood are just something that cannot be avoided with a wood deck. While a composite deck does not have those problems. The composite deck resists most warping, weathering and insects and it is a much better investment in the long run. At Miles Bradley Building and Remodeling, we highly recommend Trex Decking. Trex decking maintains a beautiful look for years to come and has a wide variety of color choices. In addition, Trex decking is hassle free, you will not need to sand, stain, paint or replace planks. Another great bonus of Trex decking it is fade, stain, scratch and mold resistant. Trex has a special three-sided shell protection and has a 25-year Limited Residential Fade & Stain Warranty. Trex is also made from 95% of recycled materials, and eco-friendly. The experienced installers here at Miles Bradley are certified Trex Platinum Contractors. We have been installing low maintenance decking for decades and can install your deck quickly and efficiently. Miles Bradley has also been the recipient of the Angie’s List Super Service Award as well as the Best of Houzz Service award. Our experts can help you determine which deck is best for your home and help you decide on which materials to use. We can help with financing options as well as save you some money in the process. Give us a call today at 248-478-8660 for Michigan or 847-920-7601 for Illinois or use our quote form now!